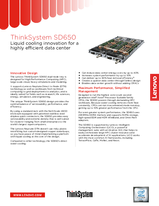 The Lenovo ThinkSystem SD650 dual-node tray is designed for High Performance Computing (HPC), large-scale cloud, heavy simulations and modeling. It supports Lenovo Neptune Direct to Node (DTN) technology as well as workloads from technical computing to grid deployments to analytics, and is ideally suited for fields such as research, life sciences, energy, simulation, and engineering. The unique ThinkSystem SD650 design provides the optimal balance of serviceability, performance, and efficiency. By using a standard rack with the NeXtScale n1200 enclosure equipped with patented stainless steel dripless quick connectors, the SD650 provides easy serviceability and extreme density that is well suited for clusters—ranging from small enterprises to the world's largest supercomputers. The Lenovo Neptune DTN doesn't use risky plastic retrofitting but custom-designed copper waterloops, so you have peace of mind implementing a platform with liquid cooling at the core of the design. Designed to run the highest core-count second-generation Intel® Xeon® Processor Scalable family CPUs, the SD650 powers through demanding HPC workloads. Because water cooling removes more heat constantly, CPUs can run in accelerated mode nonstop, getting up to 10% greater performance from the CPU. For even greater system performance, the SD650 uses 2933MHz DDR4 memory and supports NVMe storage, high-speed EDR and HDR InfiniBand, and Omni Path adapters. The SD650 is supported by Lenovo Intelligent Computing Orchestrator (LiCO), a powerful management suite with an intuitive GUI, that helps to easily orchestrate large HPC cluster resources and accelerate development of AI applications. LiCO works with the most common AI frameworks, including TensorFlow, Caffe, MxNet, and Neon. A large supercomputing center reusing hot water from direct water cooling can save an estimated 45% in electricity costs. OS Support Red Hat, SUSE, CentOS (with LeSI support); Visit lenovopress.com/osig for more information. To learn more about the ThinkSystem SD650, contact your Lenovo representative or Business Partner or visit www.lenovo.com/thinksystem. For detailed specifications, consult the Product Guide. § Based on Lenovo internal testing. * Compared to Lenovo NeXtScale nx360 M5. Trademarks: Lenovo, the Lenovo logo, Lenovo Neptune, NeXtScale, ThinkSystem, and TruDDR4 are trademarks or registered trademarks of Lenovo. Intel®, Optane™, and Xeon® are trademarks or registered trademarks of Intel Corporation or its subsidiaries in the United States and other countries. Other company, product, or service names may be trademarks or service marks of others. Document number DS0024, published February 20, 2018. For the latest version, go to lenovopress.com/ds0024.